Carson was inundated with speaking engagements, fan mail and other correspondence regarding The Sea Around Us, along with work on the script that she had secured the right to review. She was very unhappy with the final version of the script by writer, director and producer Irwin Allen; she found it untrue to the atmosphere of the book and scientifically embarrassing, describing it as "a cross between a believe-it-or-not and a breezy travelogue." She discovered, however, that her right to review the script did not extend to any control over its content. Allen proceeded in spite of Carson's objections to produce a very successful documentary. It won the 1953 Academy Award for Best Documentary Feature, but Carson was so embittered by the experience that she never again sold film rights to her work. She also found significant support and extensive evidence from a group of Biodynamic agriculture organic market gardeners, their adviser, Dr. Ehrenfried Pfeiffer, other contacts, and their suite of legal actions (1957-1960) against the U.S. Government. According to recent research by Paull (2013), this may have been the primary and (for strategic reasons) uncredited source for Carson's book. Marjorie Spock and Mary T. Richards, of Long Island, New York, contested the aerial spraying of dichlorodiphenyltrichloroethane (DDT). They compiled their evidence and shared it with Carson, who used it, their extensive contacts, and the trial transcripts, as a primary input for Silent Spring. Carson wrote of the content as "a gold mine of information" and says, "I feel guilty about the mass of your material I have here" and makes multiple references to Pfeiffer and to his correspondence. Carson further noted that "Malaria programmes are threatened by resistance among mosquitoes" and emphasized the advice given by the director of Holland's Plant Protection Service: "Practical advice should be 'Spray as little as you possibly can' rather than 'Spray to the limit of your capacity' ... Pressure on the pest population should always be as slight as possible." The academic community, including prominent defenders such as H. J. Muller, Loren Eiseley, Clarence Cottam, and Frank Egler, by and large backed the book's scientific claims; public opinion soon turned Carson's way as well. The chemical industry campaign backfired, as the controversy greatly increased public awareness of potential pesticide dangers, as well as Silent Spring book sales. 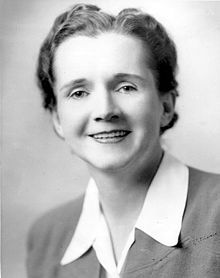 Pesticide use became a major public issue, especially after the CBS Reports TV special The Silent Spring of Rachel Carson that aired April 3, 1963. The program included segments of Carson reading from Silent Spring and interviews with a number of other experts, mostly critics (including White-Stevens); according to biographer Linda Lear, "in juxtaposition to the wild-eyed, loud-voiced Dr. Robert White-Stevens in white lab coat, Carson appeared anything but the hysterical alarmist that her critics contended." Reactions from the estimated audience of ten to fifteen million were overwhelmingly positive, and the program spurred a congressional review of pesticide dangers and the public release of a pesticide report by the President's Science Advisory Committee. Within a year or so of publication, the attacks on the book and on Carson had largely lost momentum. A variety of groups ranging from government institutions to environmental and conservation organizations to scholarly societies have celebrated Carson's life and work since her death. Perhaps most significantly, on June 9, 1980, Carson was awarded the Presidential Medal of Freedom, the highest civilian honor in the United States. A 17¢ Great Americans series postage stamp was issued in her honor the following year; several other countries have since issued Carson postage as well. In 1973, Carson was inducted into the National Women's Hall of Fame. ^ a b "Rachel Carson biography". Women In History. Archived from the original on 8 August 2012. Retrieved 13 August 2012. ^ a b "National Book Awards — 1952". National Book Foundation. Retrieved March 19, 2012. ^ "University of New England — Maine Women Writers Collection — Research — Featured Writers — Rachel L. Carson Collection, 1946–1964". Une.edu. Retrieved 2014-08-04. ^ "Rachel Carson". U.S. Fish and Wildlife Service. Retrieved 23 April 2014. ^ a b c d e f Smith, Michael (Autumn 2011). ""Silence, Miss Carson!" Science, Gender, and the Reception of "Silent Spring"". Feminist Studies. 27: 733–752. JSTOR 3178817. ^ Lear 1997, pp. 163–64. ^ Lear 1997, pp. 215–16, 238–39. Quotation from a letter to Carson's film agent Shirley Collier, November 9, 1952. Quoted in Lear, p. 239. ^ Montefiore, Janet (2001). 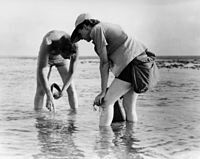 "'The fact that possesses my imagination': Rachel Carson, Science and Writing". Women: A Cultural Review. 12 (1): 48. doi:10.1080/09574040110034110. ^ Tjossem, Sarah F. (1995). "Review of Always Rachel: The Letters of Rachel Carson and Dorothy Freeman, 1952–1964". Isis. 86 (4): 687–88. doi:10.1086/357392. quoting from: Heilbrun, Carolyn (1988). Writing a Woman's Life. Ballantine. p. 108. ISBN 0-345-36256-X. ^ McLaughlin, Dorothy. "Fooling with Nature: Silent Spring Revisited". Frontline. PBS. Retrieved August 24, 2010. ^ Conis, Elena (2017). "Beyond Silent Spring: An Alternate History of DDT". Distillations. 2 (4): 16–23. Retrieved 20 March 2018. ^ "Rachel Carson". Science History Institute. Retrieved 20 March 2018. ^ "Rachel Carson". National Archives and Records Administration. Archived from the original on 2001-03-20. Retrieved 13 August 2012. ^ "Legacy of Rachel Carson's Silent Spring". National Historic Chemical Landmarks. American Chemical Society. 2012. Retrieved July 12, 2014. ^ Greene, Jennifer (February 2008). "Obituary for Marjorie Spock" (PDF). Newsletter of the Portland Branch of Anthroposophical Society in Portland, Oregon. 4.2: 7. Archived from the original (PDF) on 29 August 2015. Retrieved 29 August 2015. ^ Carson, R. (1958c). MS typewritten letter: Dear Miss Spock; 12/8/1958. New Haven, CT: Yale Collection of American Literature, Beinecke Rare Book and Manuscript Library. ^ Paull, John. "The Rachel Carson Letters and the Making of Silent Spring." Sage Open 3, no. 3 (2013) doi:10.1177/2158244013494861. ^ Carson, R. (1958f). MS typewritten letter: Dear Mrs. Spock; 26/3/1958 (1 p.). New Haven, CT: Yale Collection of American Literature, Beinecke Rare Book and Manuscript Library. ^ Lear 1997, pp. 372–73. The photo essay, The Sea, was published in Johns Hopkins Magazine, May/June 1961; Carson provided the captions for Hartmann's photographs. ^ Lear 1997, pp. 375, 377, 400–07. Douglas's dissenting opinion on the rejection of the case, Robert Cushman Murphy et al., v. Butler et al., from the Second Circuit Court of Appeals, is from March 28, 1960. ^ Lear 1997, pp. 407–08. Quotation (p. 408) from a June 13, 1962, letter from Carson to Dorothy Freeman. ^ Lear 1997, pp. 429–30. Benson's supposed comments were widely repeated at the time, but have not been directly confirmed. ^ "2003 National Women's History Month Honorees: Rachel Carlson". Archived from the original on 2005-12-08. Retrieved 2014-03-13. CS1 maint: BOT: original-url status unknown (link). Retrieved September 23, 2007. ^ Carson, Rachel (2010 ed.). Encyclopædia Britannica. 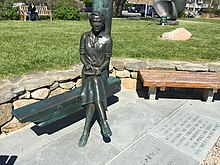 2010. in full Rachel Louise Carson born May 27, 1907, Springdale, Pa., U.S. died April 14, 1964, Silver Spring, Md. ^ Wilson, Scott. Resting Places: The Burial Sites of More Than 14,000 Famous Persons, 3d ed. : 2 (Kindle Locations 7513-7514). McFarland & Company, Inc., Publishers. Kindle Edition. ^ Lear 1997, pp. 467–58, 477, 482–83 See also the Beinecke finding aid for the Rachel Carson Papers. ^ "College Eight becomes Rachel Carson College using a gift from the Helen and Will Webster Foundation". UC Santa Cruz. 15 September 2016. ^ "Maryland Historical Trust". 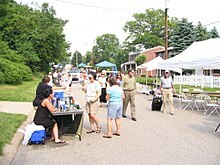 National Register of Historic Places: Properties in Montgomery County. Maryland Historical Trust. June 8, 2008. ^ Rachel Carson Elementary Archived 2011-08-09 at the Wayback Machine Archived 2011-08-09 at the Wayback Machine. Retrieved 15 June 2011. ^ "Vessels and Vehicles — R/V Rachel Carson". Monterey Bay Aquarium Research Institute. MBARI. Retrieved 29 December 2016. ^ Florida Keys National Marine Sanctuary (February 2005). "Appendix 19 Florida Keys National Marine Sanctuary Management Plan" (PDF). Florida Department of Environmental Protection. Retrieved 20 March 2017. ^ "Rachel Carson Conservation Park". Montgomery Parks. Montgomery County (Md.) Department of Parks. Retrieved 10 September 2017. ^ "N. C. Coastal Reserve and National Estuarine Research Reserve". N.C. Department of Environment and Natural Resources. Retrieved 29 August 2015. ^ "What is the Rachel Carson Prize?". Rachel Carson-prisen. Retrieved March 15, 2010. ^ Award Recipients — American Society for Environmental History. Retrieved February 14, 2015. ^ "Winners: SEJ 11th Annual Awards for Reporting on the Environment". Society of Environmental Journalists. October 17, 2012. Archived from the original on 2017-08-24. Retrieved July 15, 2017. ^ Shanklin, Radford (2013). "A Rachel Carson Memorial". Chemical & Engineering News. American Chemical Society. 91 (36): 8–9. ^ Cavna, Michael (May 27, 2014). "RACHEL LOUISE CARSON: Google lets fly a Doodle true to 'Silent Spring' writer's nature". Washington Post. Retrieved May 28, 2014. ^ Sams., Initial design & architecture by Carl Uebelhart. Further development by Aaron. "u2songs - The Women of Ultra Violet: Light My (Mysterious) Ways: Leg 1 -". www.u2songs.com. ^ Houghton Mifflin Trade and Reference Division, Courage for the Earth release information Archived 2007-09-29 at the Wayback Machine. Retrieved September 23, 2007. ^ David A. Fahrenthold (May 23, 2007). "Bill to honor Rachel Carson Blocked". Washington Post. ^ Stephen Moore (September 19, 2006). "Doctor Tom's DDT Victory". The Wall Street Journal. Archived from the original on May 30, 2007. ^ Susan M. Tierney (1 November 2007). Children's Writer Guide To 2008. Writer's Institute Publications. ISBN 978-1-889715-38-4. ^ "Young readers' (nonrequired) summer books list". Boston Globe.